Darrell Westmoreland from Montesano is a local photographer who was born and raised here in Grays Harbor, He became interested in photography in High School. And 50 years later he has made a living photographing some of the biggest names in music! Legends like George Strait, Alan Jackson, Dolly Parton & Garth Brooks to Elton John, Paul McCartney, Tom Petty and The Rolling Stones! He’s put a collection of just a fraction of the photo’s he’s taken over the years in his book “SNAP, CLICK, FLASH: All Access Pass” which is available to purchase right now at his official website. Get your Copy by clicking HERE! Darrell stopped by the Kix 95.3 Morning show today to talk about the book, and share some stories of the Artists in the pictures! Check out the interview below! Again you can purchase an autographed copy of Darrell’s Book “SNAP, CLICK, FLASH: All Access Pass” by clicking HERE! Alex Mabey Stopped by The Kix Morning Show! 17 Year Old Aberdeen High School Senior Ben Fagerstedt Sings With Michael Buble! 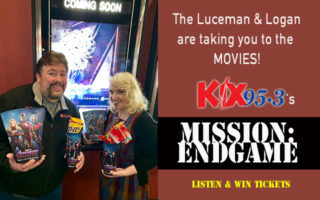 Win tickets to see The Avenger’s Endgame with the Luceman and Logan! Game of Thrones: Fire & Ice Death Pool Brad Paisley Sept 22nd At The WA State Fair Lorrie Morgan Comes to the G.H. County Fair This Summer!